Deirdre O’Connell, of Lena’s Tea Room in Carrick on Shannon, has won the Bronze Award for “Marmalade for Savoury Food” in the Artisan Awards category for her Pink Grapefruit and Cranberry marmalade at the prestigious World Marmalade Awards. 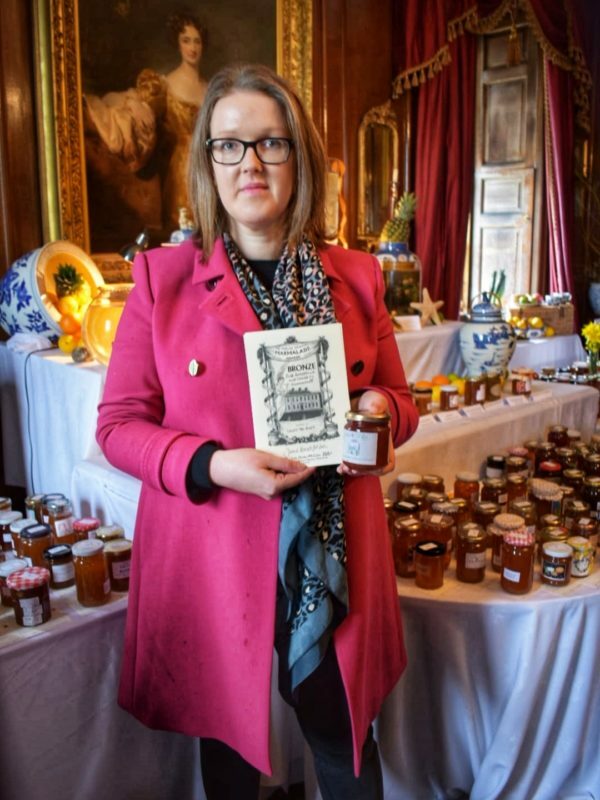 The World Marmalade Awards ceremony took place on March 16th 2019, at the Dalemain Mansion, a stately Georgian home on the outskirts of Penrith, in Cumbria, England. Founded in 2005, the World Marmalade Awards seek to preserve and expand the tradition of making marmalade. Across three categories, Homemade, Artisan and Hotel, Restaurant and B&B, the respected awards promote small scale marmalade makers using the open-pan method. The winners were decided by an esteemed panel, which included Pam Corbin (River Cottage) and Dan Lepard (The Guardian). Deirdre was one of two Irish winners of the Artisan section of the awards. Every Christmas, Deirdre prepares a limited quantity of festive chutneys, preserves and dressings that are sold exclusively in award winning Lena’s Tea Room. For Christmas 2018, Deirdre decided to prepare a Pink Grapefruit and Cranberry Marmalade, following an interesting recipe she discovered. Remarkably, this is only the second time Deirdre has tried her hand at making marmalade. “I thought The Pink Grapefruit & fresh Cranberry was a quirky recipe and that it could be lovely for breakfast or could go well with dark meats such as duck or pheasant”, said Deirdre “As a small business, we can make only small batches , and this marmalade is no exception. Before it sold out completely, I reserved two jars to enter into The World Marmalade Awards. It was a spur of the moment decision! To win a world award is absolutely amazing and a huge honour. This is especially more so , as in less than two weeks myself and my 8 team members – who are the best people to be work with – will be celebrating 8 years since we first opened the doors at Lena’s Tea Room”, concluded Deirdre. Welcoming the award, Joe Lowe, Head of Enterprise, Leitrim County Council and promoter of Taste Leitrim said, “ Lena’s Tea Rooms has become an institution of quality and innovation, so we are delighted that Deirdre’s ingenuity has been rewarded at the highest level”. At Lena’s, a vintage inspired tea room, all goods are made and baked on a daily basis. Over the years, Lena’s Tea Room – a very popular venue among those living in Leitrim and the neighbouring counties – has accumulated numerous national-level accolades, among which Goodall’s Best Scone in Ireland Runner Up – 2015 and Today FM ‘Best Café in Ireland’ – Overall winner – 2014. The Pink Grapefruit & Cranberry Marmalade is available for purchase in Lena’s Tea Room.